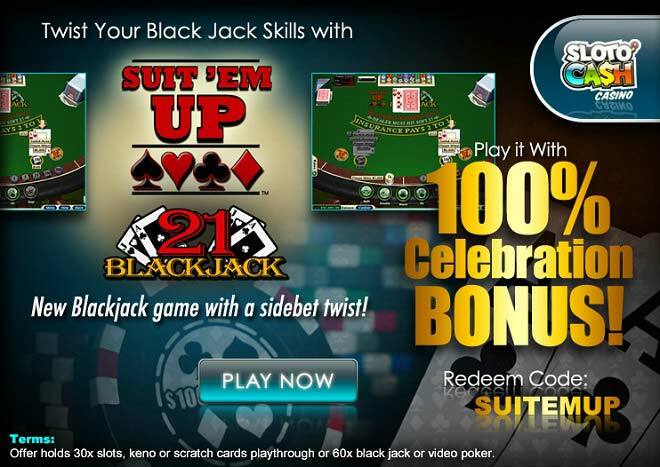 If you're a fan of playing exciting strategy-based card games such as Blackjack and you of course love to do it at Sloto'Cash, we'd like you to welcome a new and rewarding Blackjack side bet called Suit'Em Up and add a 100% Celebration Match bonus to your next deposit! The Suit'Em Up side bet is easy to play and highly rewarding! This bet is based on your first two cards and the chance of drawing both of them in the same suit. The pay out starts at any suited cards at 2-1 and will move up to 3-1 for a suited 11, 5-1 for a suited pair, 10-1 for a suited blackjack, and 60-1 for suited Aces! Keep in mind that percentage of times you'll be drawing two cards of the same suit on the initial deal is pretty high and thusly, Suit'Em Up is one of the most popular and most rewarding side best you can make! And it's especially rewarding when you claim our 100% Match to go along with your bet!